What is a sleep association? A sleep association is an external source that takes you or your child from an alert and engaged state into a state of calm to the point of sleepiness or falling asleep. A sleep association helps your heart beat more slowly and for your breathing to slow down as well. There are so many sleep associations: nursing, holding, pacifier, motion, bouncing, white noise…and a whole combo of these. I do not call sleep associations good or bad IF it is working for your family. What calms someone is not necessarily bad unless it is harming their health, or harmful to one's health in the long term. I do not like the terms “negative sleep association” or “sleep crutch” as those give such a negative connotation on something that is actually just one way a little one calms down. When babies are born they are not able to calm themselves. 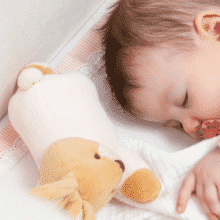 “Sleep crutches” or “sleep associations” are a huge blessing for many families, especially in the early months when babies are not yet able to self-soothe. The ability to self-sooth involves promoting effective connections between the structures of the limbic system and the cortex in a child's brain;1 during infancy not enough of these connections have been made, which is why we can't expect babies to calm themselves as infants. These little ones NEED the help of parents or other associations to become calm and sleep (which includes falling back to sleep). “Doing what works” when it comes to sleep should not be a source of guilt for any parent, especially when you are caring for an infant. Parents usually get into a rhythm that feels good to the parent and baby, and during that time parents learn what babies respond well to and what they don't respond well to. This is a beautiful exchange that happens within a parent/child relationship. Nursing or holding your baby to sleep, or being able to calm your baby in general, is part of that beautiful synchrony that a parent and baby share from the beginning. Babies wake up during the night primarily because their brain waves transfer and change cycles as they move from REM (rapid eye movement) sleep to other stages of non-REM sleep.4 It is completely natural and healthy for babies to wake at night. Waking between cycles of deep (non-REM sleep) and REM sleep on top of bursts of cognitive awareness can cause very wakeful nights for both parents and baby during these early months. Unfortunately, not all of us have night nurses or grandmas who can stay with us to help us get restorative sleep ourselves (if you have the ability to hire help or ask a family member, you should! I will link a couple night nanny sources for you at the end of this blog). And not every parent feels right about bed-sharing. Even when bed-sharing it doesn't help a whole lot with a baby who wakes every 45-90min to be comforted back to sleep. By the time babies turn around 6 months old or older (adjusted), the ability to self-regulate has begun to develop6 – thanks to all of the co-regulating parents have done up to that point. Because self-regulating abilities have begun to develop, shifting, or gradually removing, a sleep association may be successful at this time and is usually not too much to ask of children 6 months or older.7 I will mention that parents should not leave babies to cry it out because connections between the limbic system and cortex continue to be made up until the pre-school years – and even then, we all need help regulating at times; responding and being a calming force when your child is distressed is still very necessary and important. Breastfeeding is a relationship between the child and mother; and in my mind, so is helping your baby back to sleep. When it is not working for one or both of you, AND your child is old enough to shift from a sleep association, there shouldn't be any guilt. Shifting sleep associations can often be done gently and sensitively. How, you may ask? Please join me for my free webinar on “3 things you need to know to sleep train your child successfully” to learn more! PDF download available from https://www.researchgate.net/publication/258834289_Parent-Infant_Synchrony_Biological_Foundation_and_Developmental_Outcomes (accessed Jan 22 2018).